After making my cheddar cheese snack crackers I decided to try jalapeno snack crackers because I like it spicy! 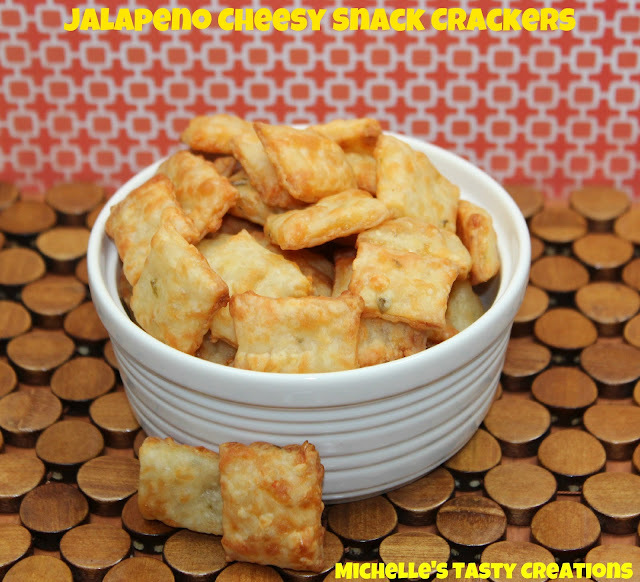 These are just as delicious as the cheddar cheese crackers but definitely have the kick of being jalapeno crackers. If you like spicy snacks like me, you need to make these. In the bowl of a stand mixer mix the butter, cheese, and salt until well combined. Add the flour and mix well, it will crumbly and dry. Add enough ice water to get a dough like consistency and until it completely sticks together. I used about 4 Tbs. Place dough in plastic wrap and chill for 1 hour. Remove dough from fridge and cut in half. On parchment or a clean surface, roll dough out until it is 1/8" thick approximately. Using a sharp knife or a pizza cutter, like I do, cut strips 1 - 1-1/2 inches thick one way then the other to make squares. Place on a parchment lined baking sheet and bake for 13 - 15 minutes. They are better when they are a little on the brown side because they are crunchier. I **need** this! Sounds like a perfect little snack! Your blog post title sure caught my attention! Love the ingredients and the cracker looks amazingly yummy! Thanks for sharing the recipe Michelle! These look incredible! I've never made crackers before, but now I can't wait. Pinned so I can try this weekend.